Malone Motorsports VelI-700r-1L Raptor 700 Velocity Intake System with Large K&N Filter by Velocity Intake Systems at Chosen Hubs. MPN: VelI-700r-1L. Hurry! Limited time offer. Offer valid only while supplies last. Raptor 700 Velocity Intake Systems Large Filter Kit!!! Same performance with 700cc's, this ones for the big cc quads and seriously tough looks! 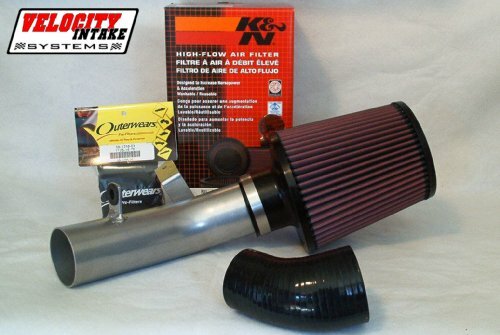 Raptor 700 Velocity Intake Systems Large Filter Kit!!! Same performance with 700cc's, this ones for the big cc quads and seriously tough looks! Replaces factory airbox with a mandrel bent and ultra-light aluminum intake tube. 2 in. to 2 1/2 in. Velocity Stack reducer at throttle body. Intended for use primarily in dry riding conditions, water repelant Outerwears and K&N filter included! Increases intake velocity for max power at high RPM's with a noticable increase in bottom end torque. Why? The stock airbox can impair airflow at high RPM while at low RPM the stock intake snorkel can collapse when you jump on the throttle with 700cc's. For that reason this intake really kicks up the throttle response and power at low-mid RPM. You will feel the mid-high RPM power increase when you completely un-restrict your 700's throttle body, works best with full performance exhaust system! This intake is intended only for dry to moderately wet riding conditions, and is perfect for TT/moto's/drag racing/absolute dune ripping. Shaves off 2.8 lbs. from stock aribox this intake with filter and hardware is only 1.3 lbs vs. stock 4.1 lbs. Pictured with optional K&N crankcase breather. Comes with K&N RU-4860 with water repellent Outerwears 20-1552-01 Intake tube starts with a mandrel bent 6061 T6 aluminum tubing; a welded bracket bolts with a stock mounting bolt. A provision on that bracket mounts the air inlet temp sensor (attached to the intake snorkel in stock form). Polished finish can be hand rubbed to a mirror shine. This Velocity Intake System completely replaces your stock airbox and snorkel from the carburetor/throttle-body to the filter. This intake kit is not intended for use in water or wet conditions. Ultralight weight with big power gains! If you have any questions about this product by Velocity Intake Systems, contact us by completing and submitting the form below. If you are looking for a specif part number, please include it with your message. © 2019 - chosen-hubs.com. All Rights Reserved.